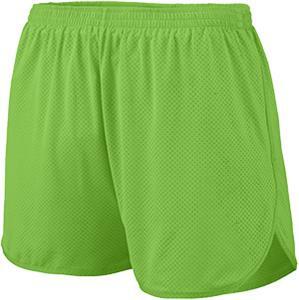 Augusta Sportswear Adult/Youth Solid Split Shorts. 92% polyester/8% spandex pinhole mesh. Wicks moisture away from the body. Heat sealed label. Covered elastic waistband. Matching inner brief with leg elastic. Crossover split side vents. 3-inch inseam (Adult)/Youth inseam graded. Self-fabric binding on hem. Hip (on half) 19" 21" 23" 25" 27" 29"
Waist (on half) 10.75" 11.25" 11.75"
Hip (on half) 14.5" 16.5" 18.5"